A couple of months ago I was reminded of my own fantastic carrot cake recipe when my pal Alice made it as her son’s first birthday cake. I hadn’t made it ages, and the other day Smitten Kitchen posted her own recipe with a maple-cream cheese frosting which I just had to try out. You see, my carrot cake recipe is my own interpretation of the revered carrot cake by Dufflet Pastries here in Toronto, which I had for my birthday years and years ago and which I just had to make my own. What makes my carrot cake so different and so spectacular is the addition of pineapple and coconut. It adds an incredible dimension to the flavour and the texture is phenomenal. I usually cheat and just buy a pre-made cream cheese frosting but really, that just doesn’t do it justice. My only complaint about Smitten Kitchen’s frosting recipe is that it was quite runny, and made way more than I needed (she was piping it on cupcakes) so I would recommend making half her recipe and adding some more icing sugar to thicken it up a bit. What I didn’t bargain for in making this for you, oh dear reader, was that I would have one of those crazy weird kitchen experiences that humble me when I get to cocky. 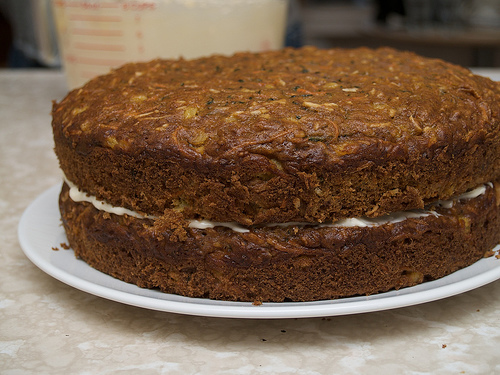 Here I was going to blow you away with my oh-so-impressive recipe and instead I get to show you a cake that looks more like zucchini loaf than carrot cake. 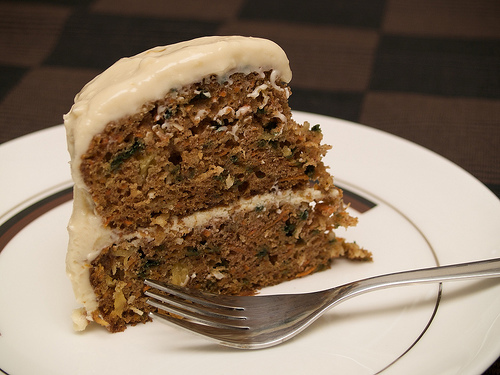 I made the cake on Saturday afternoon and by Sunday morning, many bits of carrot had turned a deep green. This is not the first time it’s happened, but well, since I was making this for a family gathering, you can imagine my dismay. Thankfully, it still tastes just as yummy as I had expected it to. So after much searching online I have something of an explanation as to why this happens, but unfortunately no tips for preventing it. Basically it sounds like its some kind of oxidation that happens to uncooked starches in the carrot. It also happens more readily with the peel section of the carrot, which explains why only some of the carrot pieces turned green. So peeling the carrots might help. I also suspect that if I really minced the carrots down in the food processor instead of merely shredding them, this may help. I also wonder if the freshness of the carrot has anything to do with it. Regardless, if anyone knows how to prevent it, I’m all ears. 3 cups shredded carrot (about three medium-sized carrots, peeled) – you may want to finely mince to try preventing the green problem! In a small bowl, sift together flour, baking soda, salt, cinnamon and nutmeg. Beat together oil and sugar. Add the eggs, one at a time, beating until smooth. Blend in carrot, pineapple and coconut. Fold together the wet and dry ingredients, stirring until just blended (don’t over mix). Divide batter up into two greased 9 inch circular cake pans, or one greased 9 x 13 inch rectangular cake pan. Bake for 35 to 45 minutes or until a toothpick inserted into the centre comes out clean. Allow to cool completely. To assemble the two round cakes, choose one and slice off a thin top layer to make the cake flat. Spread a layer of frosting on top and place the other half on top. Frost the rest of the cake. I really liked Smitten Kitchen’s maple-cream cheese frosting, but I would halve the recipe and add more icing sugar to thicken it. This cake was wonderful!! However, after reading an interview with Dufflet herself, I learned that Dufflet’s Bakery only uses butter in their recipes. So I changed the oil to butter and added around 3/4 c. walnut pieces. I didn’t like the cream cheese icing that was offered in the link, but used one from Canadian Living. See also the link to the scientific discussion.